Two diamonds, the Apollo Blue and the Artemis Pink, sold together to set the record for the most valuable earrings ever sold at an auction. 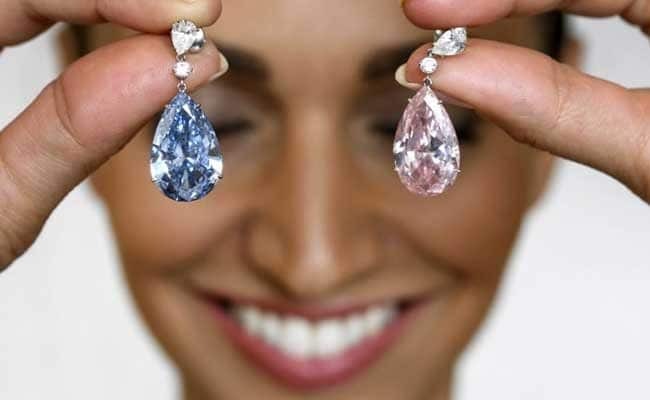 Geneva: The Apollo Blue and the Artemis Pink diamonds together became the most valuable earrings ever sold at an auction, after realising a combined total of US $57,425,478 at Sotheby's sale of Magnificent Jewels and Noble Jewels in Geneva. The internally flawless fancy vivid blue diamond and the fancy intense pink diamond, weighing 14.54-carats and 16-carats respectively, were were sold to the same anonymous buyer on May 16. "It has been a privilege for Sotheby's to be entrusted with the superb 'Apollo Blue' and 'Artemis Pink'. The results from the sale - which saw more than 90 per cent of lots sold and three new world auction records - yet again underline the strong demand for top quality diamonds, gemstones and jewels. "I am delighted that the stones will remain together as earrings. This has been a wonderful inaugural jewellery sale at Mandarin Oriental, Geneva which far exceeded expectations, with a total of over US $150 million," David Bennett, Worldwide Chairman of Sotheby's International Jewellery Division and Chairman of Switzerland, said. The auction that saw a sell-through rate of 90 per cent, also set the record for a fancy intense purplish pink diamond by Piaget weighing 7.04 carats. It sold for US $13,245,750. The sale also featured a collection of the finest diamonds and gemstones, as well as signed jewels from the most sought-after jewellery houses, which sold at double the pre-sale estimates to realise a combined total of $15,899,550. A pear-shaped diamond ring, weighing 32.42 carats by Harry Winston doubled its low estimate to sell at US $3,330,288, and an emerald and diamond ring by Harry Winston achieved five times its estimate and was sold for US $929,465. Another notable sale included a ruby and diamond brooch and ear clips by Van Cleef and Arpels which sold for a combined total of US $477,551.